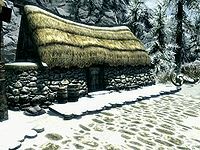 Kraldar's House is located in Winterhold, the last building on the left before the bridge to the College. It is the home of Kraldar and his manservant, Thonjolf. To the left of the entrance is a single owned bed used by Thonjolf with a couple of barrels to the right in the corner. On these are two sweet rolls and a honey nut treat. Against the south wall is a cupboard, while against the west wall is a long wooden table with a gourd, a bottle of alto wine, a bottle of Nord mead, a bucket containing potatoes, and a basket containing red and green apples on top. Hanging above from the ceiling is a bunch of dried frost mirriam, two bunches of dried elves ear, and two garlic braids. To the right is a rack holding three rabbits and three pheasants. Under this, to the right of the table is a bucket containing carrots and a food barrel. To the right of these is a set of shelves with four bottles of alto wine, four bottles of wine, and a basket containing a copy of the Alteration skill book Breathing Water. To the right of this is a fireplace with a cooking pot in front and a kettle containing two leeks on the hearth to the right. There is a round wooden table and chair with a bottle of alto wine and a sweet roll in front of the hearth and on the far side of the fireplace, still against the west wall is an expert-locked chest. Coming out from the north wall is a double bed used by Kraldar with an end table with a jug and bottle of Nord mead on top. Against the east wall is a wardrobe containing clothes. To the right is a barrel and a dresser with four bulbs of garlic, two chicken's eggs, a bottle of Black-Briar Mead, and three bunches of elves ear on top. Hanging above are three garlic braids, a bunch of dried elves ear, and a bunch of dried frost mirriam. 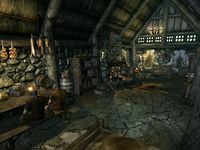 If the Imperials obtain Winterhold in the Civil War, Kraldar becomes the Jarl, moves out of this house and into the Jarl's Longhouse. Thonjolf, now Kraldar's housecarl, will still return at night to sleep in the single bed. Game data refers to Kraldar's House as Korir's and "Korri's" House. Moreover, Jarl Korir's outfit is referred to as Kraldar's, and unused dialogue from Season Unending refers to Korir as Kraldar, indicating that Kraldar was originally intended to be Jarl by default.